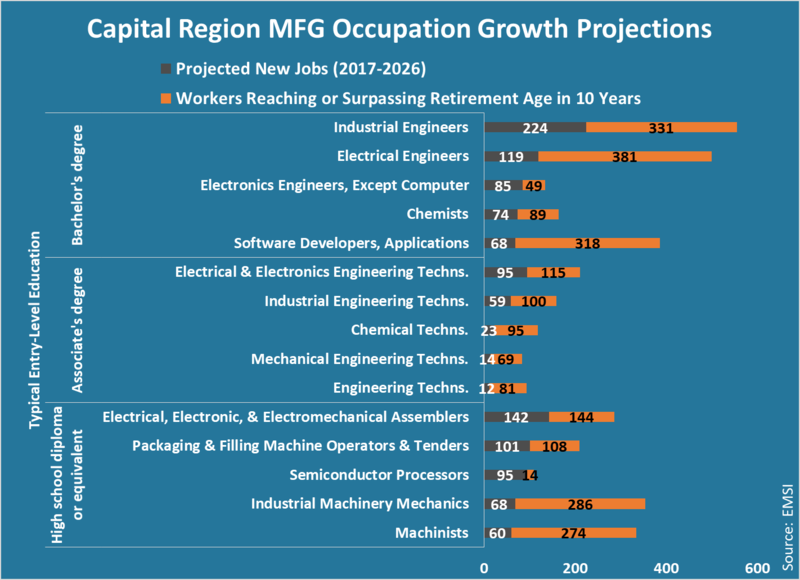 The Capital Region’s manufacturing sector employed more than 34,000 workers in 2017 and is projected to add nearly 2,800 over the next 10 years. That 7 percent increase in manufacturing employment far outpaces projections for the nation (0 percent) and state (-5 percent), according to estimates from Economic Modeling Specialists Int. (EMSI). Certified Production Technician (CPT) Program: A new eight- to 12-week-long certificate course at Schenectady County Community College, supported by part of a $250,000 KeyBank Foundation grant administered by CEG. Manufacturing Intermediary Apprenticeship Program (MIAP): A CEG program, in partnership with the Manufacturers Association of Central New York (MACNY), to assist local manufacturers in training incumbent workers for high-skill trades. Business Growth Solutions (BGS): A National Institute of Standards and Technology (NIST) Manufacturing Extension Partnership (MEP) center, CEG’s BGS unit can help manufacturers obtain grants for employee training initiatives. 1 Occupations that typically do not require prior experience. 2 Based on 2017 employment levels.